Recommendations and travel tips for Toulouse. Discover the best restaurants, attractions, shopping spots and the accommodation options in the city. 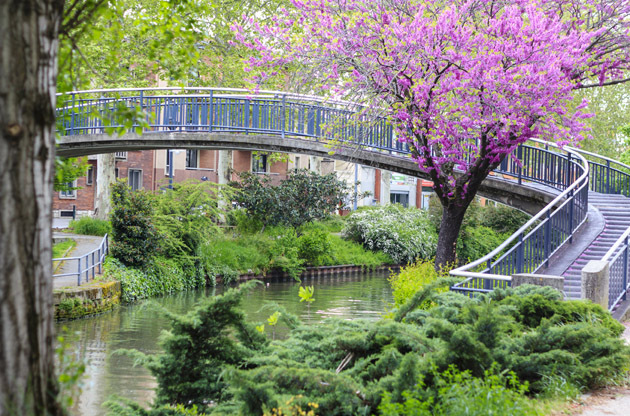 Toulouse lies in the Midi-Pyrenees region in southwestern France. The past 20 years have developed it into a centre of the space and aviation industry, where more than 30,000 citizens have found their livelihood. In spite of the economic boom, the city remains unchanged in its core, because even today, contemporary constructions follow the paths of their Roman ancestors and are built to the same style and design. Numerous red bricked buildings of olden times have earned the city its nickname of La Ville Rose (The Pink City). In the middle ages, this city was one of the wealthiest in all of France due to the extraction of blue pastel coloring from the local plants. The town has more than 50 hotels and mansions that bear witness to the previous glory and wealth of the locals of Toulouse. L'Oncopole de Toulouse, the biggest cancer research centre in Europe; is situated in Toulouse along with the headquarters of Intel and several other companies that deal with satellite systems, aviation and space centers. The university located within the city is also one of the oldest ones in Europe and holds more than 100,000 students in its campus. The climate of Toulouse is usually temperate with high humidity but as it lies in the middle of two climatic zones, uniform distribution of the weather conditions cannot be seen throughout the city. Toulouse is situated on the bank of the Garonne River in the department of Haute-Garonne in the south-west of France. It is the fourth largest city of France and is at equal distances from the Atlantic Ocean and the Mediterranean Sea. If you travel nearly 10 kilometers in the westward direction from Toulouse, you can arrive at the Blagnac Airport. In order to reach the city from there, you can opt to take the Shuttle Bus Service that will allow you to reach the main bus and train stations in the city. You can even go to the Jean Jaures or Jeanne D'Arc metro stations located in the city center, via the Shuttle Bus. Although the city itself is large; the main sights to be seen are mostly located in the historical downtown area and the best way to travel and explore the district is by walk. Toulouse has two UNESCO World Heritage Sites within it. The first being the Canal Du Midi that it shares with other cities, and the second being the Basilique Saint Sernin (Basilica of St. Sernin). The Canal Du Midi is a long canal that runs along the south of France connecting the river Garonne to the Mediterranean Sea and the Basilique Saint Sernin is an old church dated back to the 11th century that has been restored by the famed French artist, Viollet-le-Duc. The picture gallery named Galerie du Château d'eau and the literary society known as Académie des Jeux Floraux; are two of the oldest places of their kind in the world. Both places are closely linked to the rich cultural history of the area. While in Toulouse, visit the Capitole (Town Hall), the Pont-Neuf (the old bridge crossing over the Garonne), the monastery church of Les Jacobins, the City Park, the art museums named Les Augustins and Les Abattoirs, as well as the Georges Labit Museum, where artworks from the Asian and Egyptian cultures are placed on display. The Cité de l'Espace (Space City) is a space-themed adventure park that also acts as a museum for spacecrafts and some other exhibits. The premises also include a small planetarium and this attractive theme park is the perfect place for young children to enjoy. If you wish to take a walk, go to the banks of the Garonne River where you can watch the horizon as the day comes to an end; or go to watch a rugby match in the stadium within Toulouse for some loud and sporty entertainment. Although most of the shops and stores are open from 9am till 7pm, there are still a few exceptions to the timings. For souvenirs to remind you of your trip to the city of space and aviation, go to the Airbus and the Cité de l'Espace. Sunday mornings are usually the time to go shopping as there is a flea market set up in the area near the Basilique Saint Sernin and there is also a fresh produce market near the St Aubin Basilic. These markets can provide you with the best and cheapest purchases if you wish to buy on a budget. Many thrift shops and second-hand stores are also located throughout the town of Toulouse for those who wish to buy clothes and other items at cheaper rates. One of the local specialties of Toulouse is duck, and it is offered as a dinner meal by various restaurants. The Cassoulet is another famed dish of the region. It is a stew of white beans meat and pork. The Saucisses de Toulouse, a type of sausage and Garbure, a soup made from cabbage; are both local delicacies and the Foie Gras (liver of duck or goose) is also widely eaten in the region as a culinary specialty. The nightlife of Toulouse has a lot to offer due to the student population and a number of wine bars are also present within the town. For youngsters who love to party, the St. Pierre Place is popular among the local student population and will not disappoint your expectations of a fun-filled evening. The Airbus, an aircraft manufacturing company, provides tours of their premises in both, French as well as English. The hour-long tour is led by a guide that provides information about the company along with showing you some historical and promotional videos. The tour also includes a viewing of the production line. However, photography is forbidden and advance bookings are preferred as the tours are in great demand. Boating tours are also available from a number of companies that take you for a ride on the Garonne River and through the Canal Du Midi.